This is one of the stamps sets I had on my wish list from the beginning. I just love front porch swings. 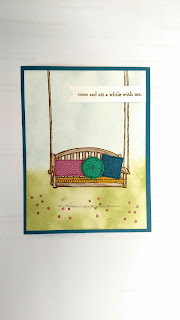 I sponged my background with Soft Sky and Pear Pizzazz on Whisper White (4 x 5 1/4) and then placed it on a Dapper Denim card base (4 1/4 x 5 1/2). 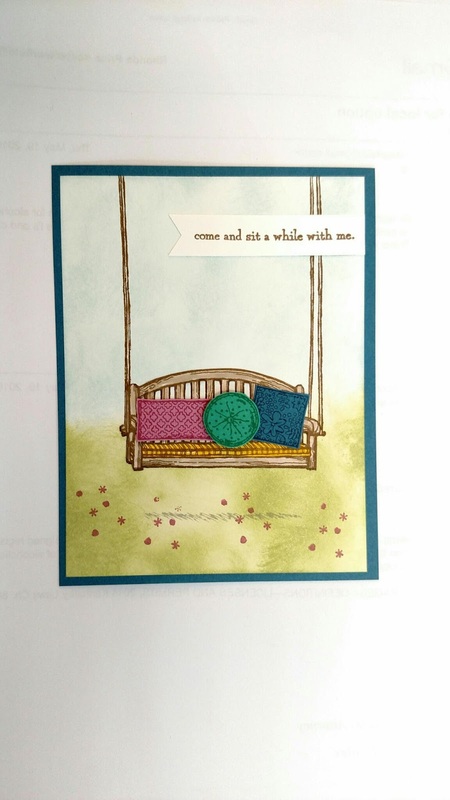 I stamped the swing, but wanted a little more dimension, so I stamped the swing on a scrap piece of paper and fussy cut it (even between the slats on the back). I stamped the pillows on Dapper Denim, Emerald Envy, and Sweet Sugarplum. and cut them out so I could pop them up. I just love the dimension on this card. I wish you could see it better.